In the fall of 2017, I was honored by Jan and Tom Cogbill by their commission request to design and fabricate an original sculpture for the then building in progress American Birkebeiner Timber Trail rest cabin. 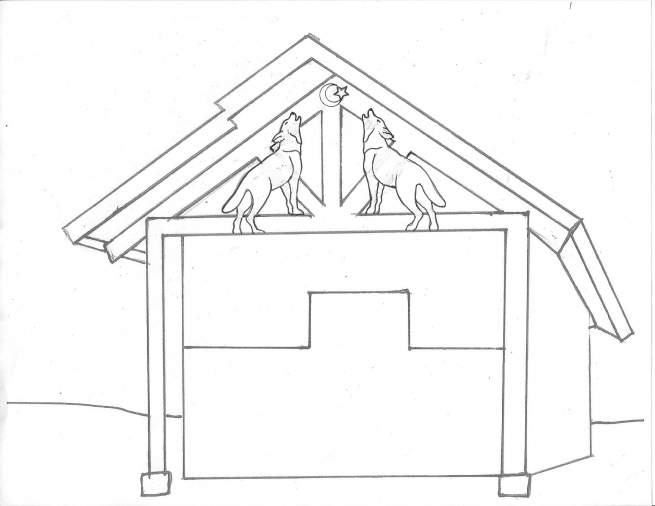 The Cogbill’s had generously supported the building of the cabin and wanted to add a unique sculptural touch of two timber wolves howling. On January 26, 2018, the completed wolves were installed on the north side of the rest cabin at Timber Trail Road and the Birkie Trail. As with other commissions, the process started with many conversations that led to a series of standing and sitting wolf design conceptual drawings. 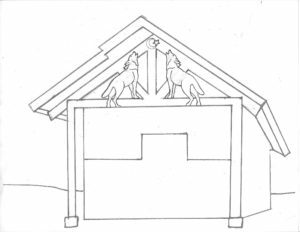 After the cabin was completed with its sturdy timber frame entrance, it was clear the two standing wolves with their front paws resting on the base beam howling at the moon and star design would best complement the architecture. Once the concept was approved, the drawing was projected life size on stiff paper attached to a studio built scale model of the cabin’s north gable end timber frame component. Forty-four and forty-eight inch tall paper patterns were cut out and transferred to a sheet of lauan plywood. The two wooden templates were then taken to the cabin to determine which scale would best fit the building design. For environmental, historic and creative reasons, I have always enjoyed using recycled materials to create original steel sculptures. 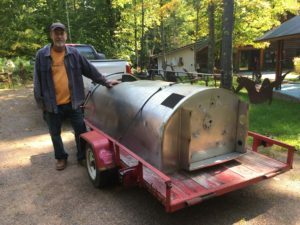 Because wells had been drilled at each of the rest cabins along the trail, the American Birkebeiner Foundation was no longer using its five hundred gallon stainless steel bulk water tanks. Learning of my Timber Trail cabin wolf sculpture commission, Pete Sievert and Kathy McCoy of Hayward gifted me with the shell of a tank that they had previously acquired. The repurposing of the discarded stainless steel water tank inspired me. 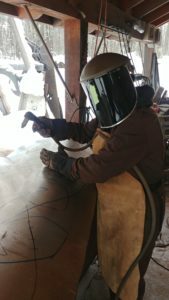 I felt it historically significant and artistically poetic that the recycled stainless steel tank be used to fabricate the Timber Trail Wolves. As with all commissions, each new creative journey involves problem solving. The materials selected for this project presented new challenges. Over the years, in the course of transport and filling the water tanks, the tank’s stainless steel had become quite beat up, resulting in dents, scratches and oxidation on the surface. To work around the most damaged areas of the steel, the true to scale paper pattern was cut into five body part templates that were used to transfer the images onto the steel as a guide for my plasma cutting of the body parts. The next step involved my husband Gary Crandall refurbishing the steel by pounding out the dents, edge smoothing and surface cleaning each individual piece. I use soap stone to draw the direction of the texture lines that he skillfully applies using an angle grinder with a variety of abrasive and polishing disks. The texture on the finished surface is reflective of surrounding environment, picking up natural colors and providing a sense of motion to the sculpture. Due to the thin and curved nature of the steel, my long time welding mentor Butch Grainger was called in to carefully TIG weld the clamped together pieces. The meticulous process resulted in the two left and right facing wolf images. Five stainless steel brackets were then fabricated for each wolf. The brackets were TIG welded to the feet and torso of the wolves to facilitate a solid multi-point attachment to the cabin’s north gable end timber framed components. The weather on the January 26 installation day could not be more beautiful; forty degrees and sunny. The installation team’s work was phenomenal with each person sharing their particular skills to help complete the project. I want to extend a special thank you to Jan and Tom Cogbill for their support, encouragement, and vision from the inception of this creative opportunity. Thanks also to Pete and Kathy for the gift of the retired stainless steel bulk tank. My mentor Butch was a great help with his precise technical assistance. This project was brought to a successful conclusion with the many friends on the installation team who all helped move the project to completion. Finally, many thanks to the American Birkebeiner Ski Foundation for their continued faith in, and support of my creative journey. This is the fourth significant public sculpture I have completed for the Foundation. I am honored by their partnership with my artistic vision. The entire process is a melding of a great team; artist, patron, technical and logistics team members. As an artist I am fortunate to see my artistic endeavors come to life in such a beautiful public setting. I hope you can soon travel by skis, snowshoes, off road bicycles, foot or car to experience the beauty of the Timber Trail Wolves. This is really nice. Thanks to all for making it possible. One more reason to be out on the Birkie trail enjoying all the sounds and sights. Just skied to see the Sara wolves today from the North End on a blue wax perfect day on perfect tracks. What a gift for skiers and hikers. The wolves are beautiful! Such a sight to behold. Many thanks to Sara, the creator, and Tom and Jan, who comissioned this great project. Yes, Thank You, dear Sara and team, for a stunning sight to behold and ponder while skiing in our piece of paradise. We are so fortunate to live in such a beautiful community of people, wolves, and trails. Sara…. you are a true artist!  Not only with your vision and skills, but the ability to communicate effectively with your “team”. Lindsay and I salute you. Thanks so much Lindsay and Lynne. © 2011 Sara Balbin – Dragonfly Studio, Drummond, WI Ph. 715-798-3848 email:gems@cheqnet.net|ProPhoto Site by NetRivet, Inc.